* Front panel keys are: ON/OFF, TARE, UNITS & HOLD. * Only weighs 75 lbs. 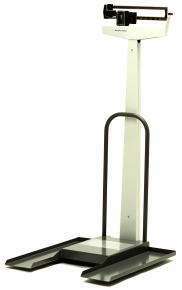 DS-800 Platform Scale 800 lb x 0.2 lb $795 free shipping continental U.S.
*Overall Dimensions: 41.3" x 41.3"
Combines a standard balance beam scale with wheelchair ramp. Package includes scale, ramp and accessories. Platform measures 26" x 28". Capacity 500 lb x 1/4 lb. Consists of a balance beam scale with large 30" x 30" steel platform (410KL). Overall 30" x 30" x 57 1/4"
Heavy-duty and can accommodate patients with heavy wheelchairs.